We could practically hear the cogs turning and the creative juices running right away when we asked our researchers if they could make their research accessible to people with vision loss. To say that everyone was excited and energised by this challenge is an understatement. 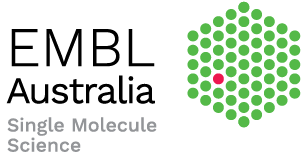 On December 11, the students and staff of Single Molecule Science (SMS) hosted a scientific discovery day tailored for the blind and low vision community explaining how we investigate the Building Blocks of Life. We designed sensory activities and tactile materials to convey scientific concepts allowing the audience to explore and discovery our research using touch, sounds and smells. In the lead up to the event, inspiration and advice for these creations were provided by Dr Erica Tandori, the legally blind artist who immortalised the Human Immunodeficiency Virus with Paper Mâché embellished with lentils, pasta, LED lights and more for the exhibition. “3-D printers were running hot,” says Dr David Jacques, SMS Group Leader and Head of the event’s organising committee. Among our visitors on the day, we welcomed people with vision loss with their companions, specialist teachers for the vision-impaired, orientation and mobility instructors, representatives from organisations including Guide Dogs NSW/ACT, Royal Institute for Deaf & Blind Children, Vision Australia, Blind Sports NSW, Blind Citizens Australia, Curing Blindness Australia, Centre for Eye Health, our own UNSW staff and students, Professor Joanne Tompkins (ARC Executive Director), and others curious about science. We also extended the invitation to Year 7 and 8 students from Matraville Sports High – a local high school UNSW Sydney works closely with as part of the UNSW–Matraville Education Partnership. The event kicked off with a welcome from Professor Eileen Baldry, Deputy Vice Chancellor for Equity Diversity and Inclusion at UNSW, and was followed by a seminar about infection and immunity from Professor Jamie Rossjohn of the Monash Biomedicine Discovery Institute. After this, the audience had to opportunity to explore a series of breakout activities created and presented by researchers. Staff and researchers, from Monash Biomedicine Discovery Institute, UNSW Schools of Medical Sciences and Physics, the Centre for Eye Health, and the Museum of Human Disease also joined us to showcase their own scientific themes. To help our visitors move between sessions, we had the support of Accessibility Ambassadors from the UNSW Student Life and Communities office. To bring the exhibition to a festive close, presenters and visitors all gathered around the Christmas Tree of Life and Death to sing the 12 Days of Christmas with new lyrics written by David Jacques to cover the themes covered in this event. …And E-bol-a in our tree !!! This was our very first full scale outreach event, which was embraced by our audience. They enjoyed learning about viruses, our immune systems, how our eyes work, how we sense touch, and much much more. Many commented that the interactive and hands-on nature of the exhibition was especially engaging. With such encouraging feedback, there is most certainly more community outreach activities for us in the future. Watch this space. We were able to offer this event with the generous support offered by the UNSW Disability Innovation Institute, the Museum of Human Disease and the ARC Centre of Excellence for Advanced Molecular Imaging. Photography courtesy of Stephen Blake, more images below.